But don’t worry, the most common reasons for performance issues are not that difficult to fix. We will have a look at 7 Tips that will help you to speed up your persistence tier and you can download them as a free Hibernate Performance Tuning cheat sheet. If you like to learn more about Hibernate performance tuning, you should have a look at my online training. Finding the performance issues as early as possible is always the most important part. The main issue with that is, that most of the performance issues are hardly visible on a small test system. They are caused by some small inefficiencies which are not visible, if you test with a small database and only one parallel user on your local test system. That changes dramatically as soon as they hit production. While the performance issues are difficult to find on your test system, you can still see the inefficiencies, if you have a look at some internal statistics. One way to do this is to activate Hibernate Statistics by setting the system property hibernate.generate_statistics to true and log level for org.hibernate.stat to DEBUG. Hibernate will then collect some internal statistics about each session like the number of performed queries and the time spent for them or number of cache hits and misses. You can use these information during development and check them against your expectations. By doing this regularly, you can avoid the most common issues caused by slow queries, too many queries and missing cache usage. And keep in mind that you are working with a small test database. 5 or 10 additional queries during your test might be several hundreds or thousands, if you switch to the bigger production database. Another common issue is the usage of the wrong FetchType. It is specified in the entity mapping and defines when a relationship will be loaded. Using the wrong FetchType can result in a huge number of queries that are performed to load the required entities. The main problem of the FetchType definition is, that you can only define one FetchType for a relationship. This will be used every time an entity gets fetched from the database. So you either have only queries that have to request the same relationships (which I doubt) or you are not able to define the best FetchType for all of them. So you need to choose the best default FetchType which in most of the cases is FetchType.LAZY. As I explained in Tip 3, you are not able to define the optimal FetchType for all queries in the entity mapping. The good thing is, that you don’t need to do that. You only need to define the ideal default behavior, which in most of the cases is FetchType.LAZY. You can either do this as part of your JPQL statement by using FETCH JOIN instead of JOIN. The additional FETCH keyword tells Hibernate to not only join the two entities within the query but to also fetch the related entities from the database. Another option is to use a @NamedEntityGraph. This is one of the new features introduced in JPA 2.1 and allows you to define a graph of entities that shall be fetched from the database. If you combine above’s entity graph with a query that selects an Author entity, the entity manager will also fetch the books relationship from the database. You can find a more detailed description about @NamedEntityGraphs and how to use them to define more complex graphs in JPA 2.1 Entity Graph – Part 1: Named entity graphs. If you need a more dynamic way to define your entity graph, you can also do this via a Java API. The following code snippet defines the same graph as the previously described annotations. OK, this is a tip that most Java developers don’t really like because it moves parts of the business logic from the business tier (implemented in Java) into the database. And don’t get me wrong, there are good reasons to choose Java to implement the business logic and a database to store the data. But you also have to consider that a database is very efficient in handling huge datasets. It can therefore be a good idea to move not too complex and very data heavy operations into the database. There are multiple ways to do that. You can perform simple operations in JPQL and native SQL queries. And if you need more complex operations, you can call stored procedures via @NamedStoredProcedureQuery or the corresponding Java API. The following code snippet shows a @NamedStoredProcedure definition for the getBooks stored procedure. This procedure returns a REF_CURSOR which can be used to iterate through the returned data set. Modular application design and parallel user sessions often result in reading the same data multiple times. It is quite obvious that this an overhead that you should try to avoid. One way to do this is to cache the data that it often read and not changed to often. As you can see below, Hibernate offers 3 different caches that can be combined with each other. The 1st level cache is activated by default and caches all entities that were used within the current session. The session independent 2nd level cache also stores entities but needs to be activated by setting the shared-cache-mode property in the persistence.xml. The caching of specific entities can be activated by adding the javax.persistence.Cacheable or the org.hibernate.annotations.Cache annotation to the entity. The query cache is the only one which does not store entities. It caches query results and contains only entity references and scalar values. You need to activate the cache by setting the hibernate.cache.use_query_cache property in the persistence.xml file and set the cacheable property on the Query. Updating or deleting one entity after the other feels quite natural in Java but it is also very inefficient. Hibernate creates one SQL query for each entity that was updated or deleted. The better approach would be to perform these operations in bulks by creating update or delete statements that affect multiple records at once. This can be done via JPQL or SQL statements or by using the CriteriaUpdate and CriteriaDelete operations that were added in JPA 2.1. The following code snippet shows an example for a CriteriaUpdate statement. As you can see, it is used in a similar way as the already known CriteriaQuery statements. As you have seen, there are several Hibernate features that can be used to avoid inefficiencies and to boost the performance of your application. In my experience, the most important ones are the Hibernate statistics which allow you to find these inefficiencies and the definition of the right FetchType in the entity mapping and the query. 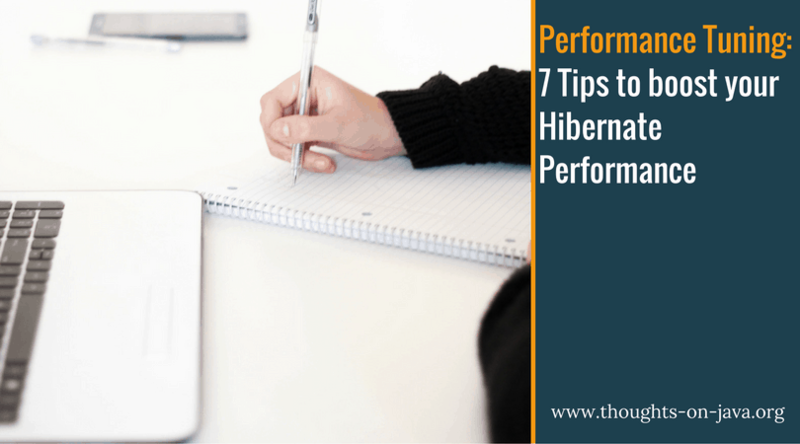 You can get more information about these and other performance tuning tips in my Hibernate Performance Tuning Online Training. Before you leave, make sure to download your Hibernate Performance Tuning cheat sheet which summarizes the tips of this post. Thanks for the tips. These tips are very helpful. But I am unable to download pdf as I am already subscribed. Is there any other way to download that? I send you an email with the link to the pdf and it was also in the mail about this post, which I send this morning. Please let me know, if there are any further issues. There is an ugly catch doing batch update/delete – @(Post|Pre)(Update|Remove) triggers do not get executed! That’s right. The batch update/delete operations are independent of the entities. So everything that works directly on the entities, like @(Post|Pre)(Update|Remove) triggers or entity caching, are not affected by the update/delete operation. Thanks lot .. Its really nice tips.